The accelerated introduction of for-profit hospitals in New Jersey over the past five years presents a challenge for patient care advocates, state legislators, government regulators, consumers and health professionals. The availability, quality and affordability of health care in our communities is threatened if and when these hospitals cut services and staff; conduct ‘insider-dealings’ with affiliates, investors and board members; cancel insurance contracts as a business strategy; violate patient care regulations, and undermine health care workers’ rights. Yet, as this paper will detail, state regulators have lagged behind in their willingness or ability to monitor and oversee the activities of for profit hospitals, and ultimately put a stop to violations of laws and regulations designed to safeguard patient care. 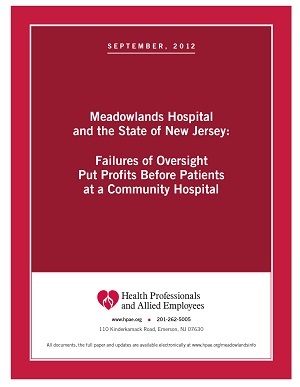 At Meadowlands Hospital, under the ownership of a privately-held for-profit group of investors (MHA) since December of 2010, citations and fines appear to be just a small cost of doing business for the owners. Even after state and federal agencies found serious violations of patient care and safety at the hospital, after reported investigations by insurance companies and government agencies, and after a publicized draft audit was reported to include numerous examples of financial failings, exorbitant profit-taking and insider-dealing among hospital board members, no effective penalties or remedies have been invoked.